The 2018 Sandhills Community College Small Business Center Entrepreneurial Summit will be on Tuesday, April 10 from 9 am –until 1 pm. The summit is free and open to the public, businesses, and students, and breakfast will be provided. Register to attend at sbc.sandhills.edu, phone 910-695-3938 or click HERE. The keynote speaker will be Michael Barbera, an award-winning consumer psychologist and strategy consultant for Fortune 50 companies. Barbera is a business psychologist who is involved in both practical and academic endeavors. His areas of practice are consumer behavior, consumer emotions, social psychology, decision-making, brand management, marketing, and long-term business strategies. Michael is currently employed as the CEO of Barbera Solutions. His clients can be found on the Fortune 50 list and several television programs such as ABC’s Shark Tank and Bravo’s Million Dollar Listing. Michael shares his research and experiences as a keynote speaker for public and private organizations, as the host of the Clicksuasion podcast, and twice for TED to discuss human perception of gender-neutral restrooms. In 2015, the White House recognized Michael for his contributions to entrepreneurship. This work includes development and validation of consumer emotions, consumer behavior, product placement, consumer experiences and business growth strategies. Consumers are consistently reminded of brands, products, and services. Businesses understand there are endless opportunities for consumers to spend money and consumers know that companies are actively seeking their attention and money. How do companies build trust from marketing for a positive customer experience? Businesses use behavioral and social science techniques to nudge consumers into a decision that best supports the company’s objective and an equal value to the consumer. Michael Barbera will discuss the psychology of clicks, purchases, and persuasion that businesses use to build a positive customer experience. Clicksuasion has three learning objectives, (1) understand your consumer’s behavior, (2) enhance your relationship with your customers, and (3) generate increased demand through an improved consumer experience. Consumers often make purchases because of emotions. Marketing campaigns often target how customers think, feel and make decisions. Prices are usually designed to persuade customers to make specific choices. Large corporations have access to behavioral science resources that aren’t available to small business. In this live-recorded panel for the Clicksuasion podcast, four behavioral scholars, marketers, and entrepreneurs will discuss how small businesses could use behavioral science to improve their persuasive messaging. Consider a visitor who has just registered for a newsletter or promotion on a website and lands on a “thank you” page. Since that visitor has already engaged with the website and is in an “interactive state,” additional offers on “thank you” pages typically earn a 39% conversion rate. Nudge Sandhills panelists will include Mariel Beasley, Cameron Cruse, Stevie Pena and K. Melissa Kennedy. Clicksuasion host Michael Barbera will moderate the panel. Mariel Beasley is a Principal at the Center for Advanced Hindsight at Duke University and Co-Director of the Common Cents Lab – a sub center committed to improving the financial behavior of low- to moderate-income households in the United States. Working directly with credit unions, non-profits, and local governments, Mariel incorporates findings from the behavioral sciences to design and rigorously test ideas to help members, clients, and residents lead happier, healthier, and wealthier lives. Mariel also teaches a Master’s level course in Behavioral Science for Municipal Policy at Duke University. Each year, students work with local government agencies to incorporate behavioral insight strategies to address pressing policy challenges, such as improving trash compliance, encouraging citizen engagement, and increasing participation in employee wellness programs. She’s an internationally acclaimed expert and bestselling author happy to share the not-so-secret actions that have led to impressive outcomes for Fortune 100 corporations, major educational institutions, start-up companies, and entrepreneurs. Melissa was recently named to 2017 Triangle Business Journal’s 40 Under 40 Leadership List. Cameron Cruse is a mother of two kids and a proud Army wife. Upon completing her Masters in Architecture from the Savannah College of Art and Design in 2011 – she did what most Military families do – she moved. An optimist with southern roots and a passion for the creative, she co-founded R. Riveter in 2011. In 2017, Cameron stepped onto the red carpet at TEDxSandhills. Stevie Pena, a Licensed Therapist and Addictions Specialist, focuses on helping people attain personal and professional goals by capitalizing on personality preferences. A unique background of military leadership and mental health counseling enables her to work with individuals and organizations alike to create collaborative environments, while presenting information in a relevant and relatable manner. Stevie consults with various publicly and privately funded agencies, utilizing personality preferences to provide leadership development training, conflict resolution, crisis intervention, and communication skill development. Understanding how personality affects individual choice, Stevie translates this information for use in areas such as marketing and sales. Stevie also teaches Management and Psychology at the local University while maintaining a small private counseling practice. The mission of the SCC Small Business Center (SBC) is to increase the success rate and numbers of viable small businesses in North Carolina by providing high quality, readily accessible assistance to prospective and existing small business owners that will lead to job creation and retention. The SBC Network assists in starting an average of more than 770 businesses each year. Small Business Centers have an economic impact in 90% of all NC Counties each year, helping to create and retain nearly 3,600 jobs annually. The SBC offers free seminars targeted for the needs of small business owners and startups. 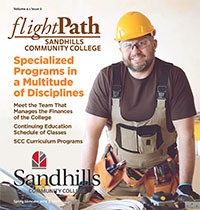 Register for free seminars by visiting our website at sbc.sandhills.edu. If you would like information about starting a business or wish to discuss specific needs regarding your business, please contact Teresa Reynolds at (910) 695-3938 or reynoldst@sandhills.edu.